The Playback pop-over contains options controlling animation playback. Display and allow changing the current scene sub-frame. Don't allow selecting frames outside of the playback range using the mouse. The Keying pop-over contains options that affect keyframe insertion. If a key insertion is attempted outside of the main time range of the cycle, it is remapped back inside the range. When overwriting one of the end keys, the other one is updated appropriately. 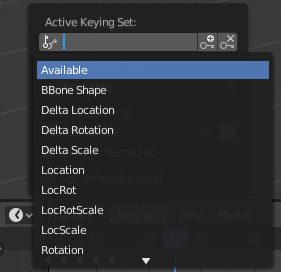 It synchronizes the horizontal panning and scale of the current editor with the other editors (Graph, Dope Sheet, NLA) when this option is set. That way you always have these editors showing an identical part of the time you work on. Markers are used to denote frames with key points or significant events within an animation. Like with most animation editors, markers are shown at the bottom of the editor. For descriptions of the different marker tools see Editing Markers.